AutoExpo2012: The Yamaha YZR-M1 | IAMABIKER - Everything Motorcycle! 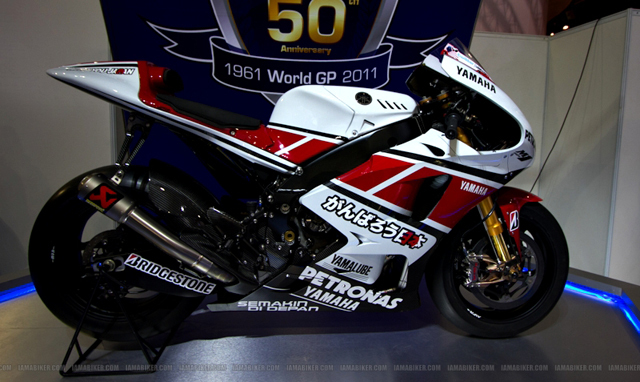 The 800cc MotoGP racing machine developed by Yamaha, the YZR M1, is on display at Yamaha stands at AutoExpo 2012. The name M1 stands for ‘Mission One’, and was given to the first FZR M1 which was an inline-4 900cc made in 2002. The M1 stands for its name, winning many titles over the years with some of the most popular MotoGP riders such as Valentino Rossi, Jorge Lorenzo and Max Biaggi. Jorge Lorenzo on his visit to the Yamaha stall spent some time with the M1 as well.